Project involved the construction of a 3400 SF addition and renovation of a 1500 SF portion of the existing building. 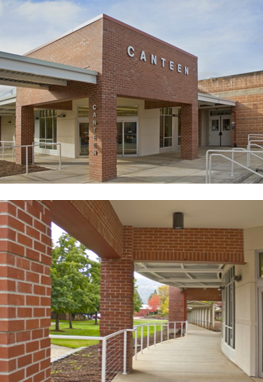 The new construction included a curved cantilevered canopy over the sidewalk. Kevcon was contracted to complete the project after the original contractor abandoned the project with numerous deficiencies and no structural steel to hold up the walls. The project had languished for over a year before we arrived. Our first task was to determine all of the substandard and incorrect work. We then fabricated and installed the missing structural steel members and rebuilt all of the exterior framing and roof joists. The exterior masonry had only been partially completed and none of the embeds were present. We corrected this and then completed the masonry. Construction also included metal stud walls, gypsum board walls, stucco exterior, EPDM roofing, gypsum board ceilings, I-bar ceilings, paint, wall coverings, ceramic tile, vinyl flooring, lighting, mechanical, fire sprinklers, and low voltage controls.